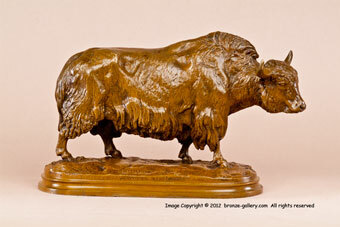 Isidore Bonheur was well known for his superb sculptures of cattle which are considered among his finest works. He created several different breeds of cattle and this is a rare bronze of a Scottish Highland Bull. Isidore's sister Rosa Bonheur visited the Scottish Highlands in 1855 and was strongly influenced by the animals and people that she met there. She did many sketches for later works and certainly would have shared her experiences with her brother Isidore. The Scottish Highland cattle are a distinct breed established in the mid 19th century. They are handsome animals with long horns and shaggy hair. These cattle are very hardy and used to surviving in the rugged Scottish hills,thriving in a landscape where many other bovines would starve. This rare bronze shows a fine Highland Bull, it has sharp details and a medium brown patina. 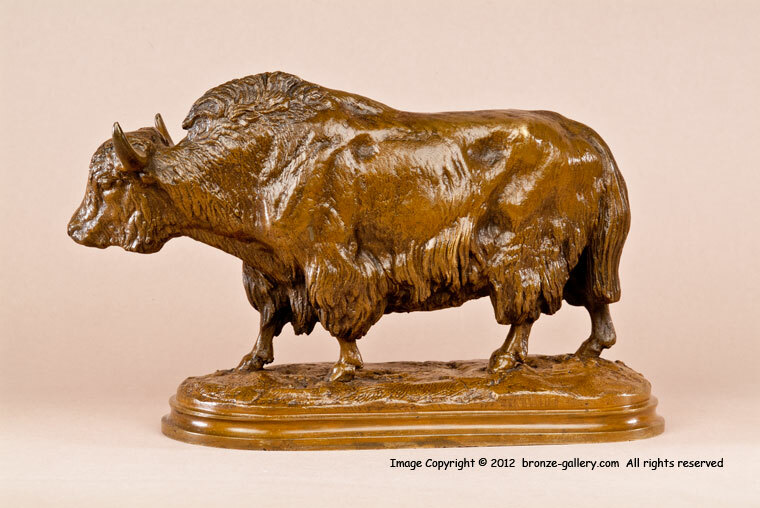 Bonheur has captured the nature of these unique cattle in this fine model.